Boxing View: Will Vicelles Stop Onggocan in their VISPROBA Battle in Cebu? Mark Vicelles -- born in Mindanao's Sultan Kudarat Province -- feels the confidence of the undefeated warrior. "The Thunder" has never lost in ten combats, stopping half of his foes in tough fashion, and his goal is to keep walking the shining path of success with the title of VISPROBA light flyweight king bestowed upon him. Good plan. Robert Onggocan, on the other hand, comes to this ten-stanza mission fresh from delivering knockout victories in his last two battles. However, this well-focused Zamboangueño nicknamed "El Rapido," has endured defeats four times in his fifteen-fight career. "Vicelles is unbeaten. Onggocan is not. That is no problem." says a fan in the promoter's Facebook page. "Pacquiao has loses. Important is how you fight," the aficionado said. True, important is how you fight. In the case of Robert Onggocan, the four setbacks in his 15-fight career have been hard-fought blow-by-blow wars against mean, strong, tough warriors of high caliber weaponry. Let's take a close look. Onggocan lost a close combat in Germany in a 10-round rumble against unbeaten world-ranked European champion Mirco Martin in Saarbrücken. The brave Onggocan also yielded in thrilling meelee to former world-title challenger and current world-ranked WBC # 8 Pedro Taduran, the same man who went twelve round against undefeated tiger Wanheng Menayothin. "El Rapido" Robert Onggocan battles lions and tigers in their own backyard, and fans like that. In addition, Onggocan lost a close 10-rounder against to Jeronil Borres in a tough really close rumble that many fans and one experienced judges saw it a draw. And most recently, Onggocan lost by points to former world-title challenger, current WBC International Champion and world-ranked WBC #1 light flyweight Jonathan Taconing. That was a really good ten-chapters battle in which Onggocan held his territory against Taconing's fury, fighting his heart out, never capitulating. Absolutely yes, Robet Onggocan is used to climb the battle ring to trade blows against furious enemies. He climbs the ring proud. None of those rough big jaguars world class strikers have been able to stop Onggocan. Will Vicelles do it? In sharp contrast, Vicelles have not been in the ring against any lion. His ten opponents are not of world-class level. Not even close. That's the dilemma. Who will win? For Vicelles of the Omega Gym, this battle is his golden chance to prove to his fans that he is a real tough-nut-to-crack, as well as the moment to claim the vacant VISPROBA belt, his first title in pro boxing. For Robert Onggocan, he just does not want any more loses, period. Only victories for him in the road ahead. 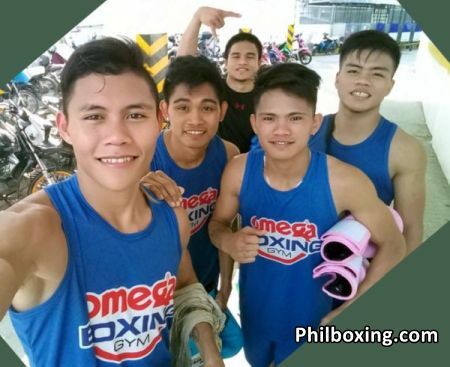 "The Thunder" Mark Vicelles is trained by 33-year-old boxing Omega coach Julius Erving Junco of Leyte, while "El Rapido" Robert Onggocan is prepared by veteran trainer former boxer Dino Olivetti, 45, of Biñan City, Laguna Province. Omega Fighers invite fans to their show April 5 at Parkmall Mandaue. The fight will be supervised by the Games and Amusement Board (GAB) Cebu Extension Office Head Arlene Olondriz, GAB Cebu Boxing Chief Rolando "Lando" Mendoza and GAB supervisor Glenn Sonido Agena. Boxing fans in Cebu City and Mandaue can not miss the Vicelles vs Onggocan Light Flyweight VISPROBA rumble in at Parkmall April 5. So mark it in your cellphone reminders. The author Carlos Costa is a Panama boxing reporter living in Cebu. Carlos can be reached by email carlos512@hotmail.com and whatsapp/viber: 09184538152.